The What: The Attero Tech unBT2A and unD6IO-BT are the first Bluetooth-enabled audio devices designed specifically for use with commercially installed AV systems, according to the company. The What Else: Both Attero Tech Bluetooth audio interfaces employ a consistent, one-button pairing and connect process that avoids the frustration often associated with pairing consumer Bluetooth products. The pairing button is defeatable for restricted-use applications with third-party control systems that wish to remotely manage the Bluetooth interface and pairing process. A front-panel LED indicates connection status. Each unBT2A or unD6IO-BT interface can be assigned a customizable, Bluetooth-friendly name for applications with multiple co-located interfaces to minimize errant connections. The interfaces are compatible with most smartphones, iPads, and Android tablets. 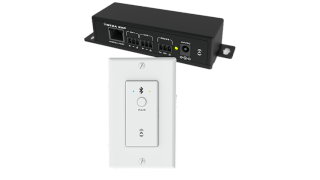 The Bottom Line: The unBT2A provides balanced analog audio outputs for universal compatibility with any installed audio system, making it well suited for hotel ballrooms, conference centers, restaurants and bars, sports facilities, spas, and convention centers. Featuring 802.3af-compliant PoE, the unD6IO-BT works with any compliant PoE network switch, and is recommended for installs in venues such as hotel ballrooms, conferencing applications, convention centers, restaurants and bars, and sports, spas, and fitness facilities.